Information has emerged that the conflict between indigenous people in Puragi village, South Sorong, and PT Permata Putera Mandiri, a subsidiary of the Austindo Nusantara Jaya Group, has resulted in a string of aggressions from police mobile brigade (Brimob) officers working for the company in recent months, since it recommenced deforestation on the disputed land. In the most serious incident, on 23rd October, a man was savagely beaten by three Brimob guards for trying to defend his land. Yayasan Pusaka and the Iwaro Student Network (IPPMI) recently went to the area to investigate – here’s the report they compiled. Starting in September and continuing until now, seven clans who hold customary rights to land in Puragi village, Metamani sub-district, South Sorong Regency, Papua Barat province, have staged a “customary law blockade” to stop work and establish limits to the areas oil palm plantation company PT Permata Putera Mandiri (PT PPM) can clear, around places known as Ureko and Nyono. The seven clans are: (1) Gue, (2) Atoare, (3) Mengge, (4) Bumere, (5) Kawaine, (6) Oropae 1, (7) Oropae 2. The reason for the blockade was that since the initial land clearance and planting, up to and including the more recent ongoing clearance of land which started in September 2017, the company has not carried out its obligation to hold a decision-making meeting with the community to reach an agreement about the status of the land, and compensation for any ways they have been disadvantaged or lost sources of livelihood, including forest products and food sources. The company has also not openly discussed with them empowerment programmes concerned with economic, social and cultural rights. The company has ignored customary laws and community demands and continues to clear and destroy the forest. Sometimes a contractor says they will take up the issue or meet the community’s demands, but this has yet to occur. This has led to an increasing level of tension between the community and the company, which makes use of police mobile brigade to guard its concession. These Brimob guards have been involved in acts of violence and intimidation and have made threats of beatings, arrests and other forms of aggression. On 12th October 2017, AwasMIFEE sent a list of questions to the Austindo Nusantara Jaya group, mostly focussed on sustainability information in its annual report, which seemed at odds with what was happening in its concessions in Papua Barat province. Of particular concern was the recent land clearance in an area which is the subject of a long running dispute with the Iwaro people in Puragi village. Even though local politicians have committed to seek a resolution of this dispute, the company appears to have been moving fast to clear the area before this process is settled. The company’s responses came too late to be incorporated in the article I wrote about this, but ANJ’s head of corporate communications, Nunik Maulana Maharani did eventually respond on 8th November. The replies are posted below in full. I have kept my comments kept to a minimum, however it should be noted that the issue of the recent forest clearance is not directly addressed, whilst the attempts by local politicians to find a solution to the dispute are acknowledged. The key question therefore remains, why is land clearance taking place while this mediation is still supposedly ongoing? Q: In your 2016 annual report, you stated that a new management plan was being produced and would be circulated to stakeholders when completed, although as far as I am aware, neither local groups nor international organisations that have criticised ANJ in the past have received a copy. Has this plan been finished? If there is a revised management plan and new HCV/HCS assessments, would it not be appropriate describe the new clearance as a new planting and resubmit a public notification on the RSPO website under the New Planting Programme to meet RSPO P&C 1.2? Especially since ANJ has stated that the original HCV assessment failed to identify an area of primary forest. A: ANJ Group (ANJ) has three palm oil concessions in West Papua, each under the name of PT Austindo Nusantara Jaya Tbk (ANJT), PT Putera Manunggal Perkasa (PMP), and PT Putera Permata Mandiri (PPM), in a form of contiguous block totaling 91,209 ha. A draft conservation plan is complete pending an internal review before elements of it are made public. The ANJT portion is going through a second phase of internal review. We will be participating in a consultative workshop in Jakarta which will discuss the important elements of the plan with key stakeholders. This workshop will lead to the formation of a wider regional platform which will discuss the role of sustainable oil palm development in the Conservation Province of West Papua. It is necessary to resubmit a public notification on the RSPO website as we are currently in discussion with the RSPO secretariat regarding new planting in PPM and PMP. The ANJT HCV Assessment Report is under review. In support of RSPO and its responsibility for sustainable palm oil, ANJ’s plan for the next five years is to develop up to 23,000 ha of oil palm plantation. ANJ is committed to protecting its identified conservation area using the precautionary principle. The conservation area would include late succession and secondary dryland and wetland forests. The conservation area is a continuous blocks fitted into a landscape setting. The conservation of the wider landscape beyond the ANJ site will depend on discussion and agreement of other stakeholders. Q: This land is of particular concern, because there is an unresolved land dispute on the land in question, between PT PPM and the Gue clan and other clans which own customary land in Puragi village. In 2015, Yakomina Gue brought a court case against the company, in which the judge ruled there was no case to answer, but on a technical point, saying that the Gue clan should have included other parties in their complaint. Because of this the substance of the dispute was not adequately resolved through that court case. Local sources have told me that a meeting took place on 16th June 2017 in Sorong, which company representatives attended, with the outcome that the Sorong Selatan District Legislative Council agreed to act as intermediaries, however the dispute is still not settled. ANJ has also acknowledged the dispute in its recent Sustainability Report. How is continued clearing on disputed land consistent with ANJ’s stated commitment to FPIC? Should the dispute not be resolved first? A: In July 2016, the District Court of Sorong declared this dispute as inadmissible. The traditional norm for land inheritance customary rights is patriarchal, thus making Yakomina Gue not the rightful owner. Yakomina Gue has to resolve this conflict internally with members of her clan. ANJ is in no position to interfere in clan inheritance matters. The rightful owners of the land have given their consent to and been compensated by ANJ prior to land clearing. An oil palm company named PT Indo Asiana Lestari has been trying to negotiate with the Auyu people living in several villages in Mandobo and Fofi sub-districts of Boven Digoel, including Ampera, Ikisi, Navini and Yare villages. Frengky Hendrikus Woro, a resident of Yare village, explained to Okto Waken of the Justice and Peace Secretariat of Merauke Catholic Diocese that “The majority of clans do not consent to the company’s plans because we don’t want to lose our land and forest”. The company’s public relations staff, known as Yakub, has been trying to persuade the community, but their opposition continues. The company has also asked a well-known community figure, Fabianus Senfahagi, to help convince the people to accept the company’s request to plant oil palm in their area. Despite their efforts, the community have refused to sign a letter of agreement to allow the company to operate. Fabianus has explained to them that the company would divide the land into a core plantation and a ‘plasma’ scheme (a form of profit-sharing with the local community which is obligatory under Indonesian law). “The company’s public relations rep said ‘We’ll pay special attention to customary land owners’ rights, you’ll be sitting pretty, you’ll get your wages at the end of the month, and a guarantee that this special treatment will extend to your children and grandchildren too'”, Frengky Woro related. Around 20 landowning clans will be directly affected by the plantation company including the Woro, Mukri, Yame, Misa, Beni, Hamagi, Tifahagi, Nohoyagi, Senfahagi, Aweyoho, Sagi, Soh, Maa, Mabo, Bung, Sifiragi, Abugagi, Hanagi, Awe and Momu clans. Two of these clans, Senfahagi and Aweyoho, support the company’s plans. Austindo Nusantara Jaya wants to be seen as an environmentally-friendly company. 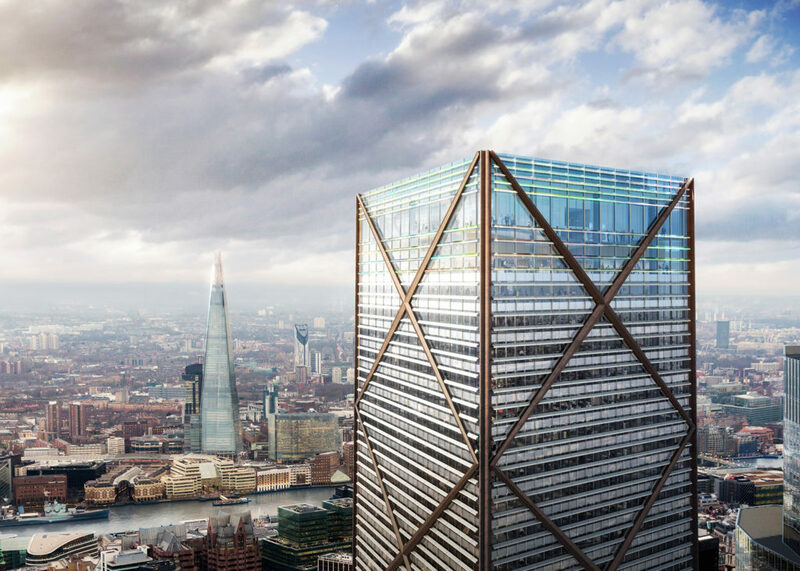 Sixteen pages of its 2016 Annual Report went into considerable detail on its sustainability practices, and, on 11th October, a new Sustainability Report was published. Packed with commitments, it gives the impression of a company at the forefront of the sustainability movement . As is often the case, this does not match what is happening on the ground. Deforestation has recently recommenced in both of the company’s operational plantations in South Sorong Regency, Papua Barat province. The 300 hectares cleared since July in PT Permata Putera Mandiri’s concession is of particular concern, because it is on customary land belonging to the Iwaro people from Puragi village, who have disputed ever giving the company permission to develop an oil palm plantation on their land. The company claims it has the consent of the community and has circulated a map showing an area of 3494 hectares belonging to the Iwaro people in Puragi, signed by 13 community members in July 2013. The Iwaro people, on the other hand, say they believed they were only giving permission for an access road through their land. They also claim that there are 24 clans with land rights in the village, but only thirteen were included. The signing allegedly took place at 4am in the village hall, guarded by members of the police and military. Land boundaries are now also disputed, since a conflict has subsequently emerged over customary land boundaries between the Iwaro people and their neighbours, the Awe’e. ANJ’ right to use the land has been actively challenged since early 2015. Supported by students from the Iwaro ethnic group, the community staged a series of protests. In one of these thirty people were arrested and Obet Korie and Odi Aitago were subsequently given prison sentences of one year and 8 months respectively for damaging the fence of the company’s office compound. In late 2015, a civil case was brought against the company by Yakomina Gue, representing the Gue clan. On 25th July 2016, the court rejected the case on a technical point, making the dubious claim that the case should also have been brought against other Papuans, who received small compensation payments in 2013 (Yakomina’s legal case was based on not having been involved in those negotiations at that time, although she was a rights holder). With limited funds and little faith in the Indonesian legal system the Gue clan decided not to appeal the case, and would try customary methods of settling the dispute instead. Sanusi’s eyes were full of tears on Wednesday (6/9/2017) has he told of the sad state of affairs in his village, Gane Dalam over the last three years. Rhinoceros beetles have been attacking their coconut farms, and the damage to the plants has spoiled the harvest. Sanusi is the head of the Copra Farmer’s Group, who had come with another farmer, Hardi Salman, to the North Maluku branch of Walhi to recount the problems they are facing. “Since Korindo’s oil palm company moved into our area, our plants are plagued with parasites. 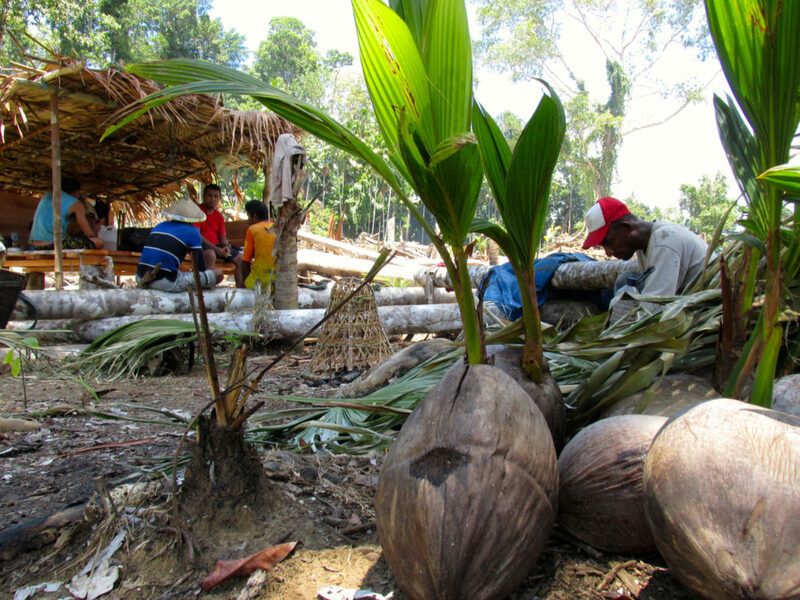 Dozens of coconut farmers’ harvests are affected,” he said. They had come on a boat with an outboard motor from Gane Dalam to Labuha in South Halmahera. Three hours journey over difficult seas, after which they caught the passenger boat to Ternate in the afternoon. On arrival in Ternate, they went to the Walhi office there. They complained to the environmental NGO in the hope that of getting the attention of the local or central government. “I came here in the hope that our voice from the small island (Gane) will be heard by the local or national government. Only those who care about the fate of farmers will look at us”, he said. He explained that previously from one hectare of coconut trees, farmers could make anywhere between 100 and 800 kilograms of copra. Now the highest harvest was only 50 kilograms. On 9th August 2017, a member of the Indonesian armed forces shot dead Theo Kamtar in Poumako Port, Timika. This incident was part of a dispute where indigenous fisherfolk felt their livelihood threatened by better equipped migrants from other islands in Indonesia, who were dominating the catch. Elements of the state appear to have sided with the migrants, and eventually crushed their resistance with lethal violence. Here is the report of the investigation into the incident carried out by the Justice and Peace Secretariat of the Timika Catholic Diocese. The situation before the incident. In recent months a dispute has emerged between traditional indigenous fisherfolk who hold customary rights, and semi-modern fishermen, that come from outside Papua (migrant fishermen), who normally use large nets or seines to trawl for fish. Because they use these large nets, often hundreds of metres long, the indgenous fisherfolk’s catch is starting to decrease dramatically, especially when the semi-modern fishermen are working close to indigenous fishing areas. In an attempt to find a way out of this situation, the indigenous fisherfolk took the initiative to arrange a meeting. In the meeting they proposed two options: either the migrant fishermen would not be allowed to catch fish in the waters near the river mouth, or the indigenous fisherfolk and migrant fishermen would share out the roles – the indigenous people’s job would be to catch fish in the river and out to sea while the migrants would sell them on. Aside from these two options, a third choice was discussed, that the migrant fishermen could still go out and look for fish, if the area they used was sufficiently far out to sea. The issue was officially discussed three times in the last three months. The first meeting took place in mid-June at the Poumako port in Mimika. 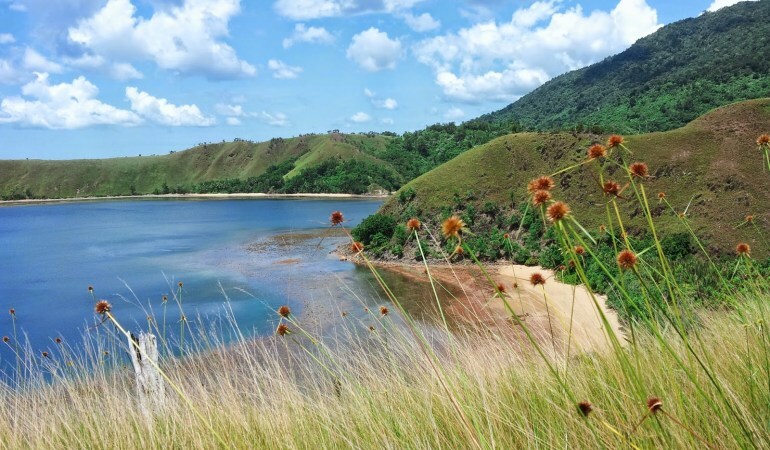 The second discussion in July was at the East Mimika sub-district office and the third on 1st August in the Mimika Marine and Fisheries Agency district office, in the Bupati’s office building. All stakeholders attended all three meetings. However, on the 7th August, the Head of the Mimika Marine and Fisheries Agency, Leentje A.A. Siwabessy, held a closed meeting in the agency office meeting room, which solely discussed the migrants’ fishing operations. According to the Meeting Report (document reference 253/435/2017) issued by the Marine and Fisheries Agency (which was later claimed to be the outcome of this meeting), seven village heads from East Mimika sub-district were present (from Hiripau, Tipuka, Poumako, Kaugapu, Mware, Pigapu and Wania villages) and relevant officials, including Captain Rohi King (Operational Section Head from the Timika Naval Base), Ipto Barnabas (Water Police Unit Head from Mimika Police HQ), Kopda Usman (village military representative for Poumako village), Rachel Latuheru (Fisheries and fish farming section head in Mimika Regency), Wesly Simanungkali (Conservation and Monitoring section head) and Lucky. J. Wokas (Section chief or coastal marine and small islands of Mimika Regency). This time local fisherfolk were not invited to the meeting, nor were the Kamoro People’s Institution (Lemasko) or other stakeholders which had been present in the previous three meetings. Local fisherfolk and LEMASKO were not made aware of this meeting or its outcomes. However, on the evening of the 8th August 2017, one of the migrant fishermen came to the house of the head of neighbourhood association (RT) 9 in Pomako to say that the migrant fisherfolk had been given a permit to catch fish and they were going out to sea. Then on 9th August 2017, a shooting incident took place in front of the Harbour Police office (KP3 Laut) which left one person dead and two civilians and one soldier wounded. People around Poumako port heard the sound of a fishing boat’s engine. The sound could easily be recognised as coming from the boat of one of the semi-modern fisherman who had been prohibited from going out to sea while the local government was still facilitating an agreement between themselves and the indigenous fisherfolk. The indigenous fisherfolk went to the berths used by the migrant fisherfolk. Their suspicions proved correct. They could see for themselves that around 20 motor boats belonging to migrant fisherfolk had gone to sea to catch fish. The indigenous fisherfolk stated to coordinate amongst themselves and decided to go out and find the migrant fishermen and warn them not to catch fish in the area. However, because the passenger ship KM Tatamailau was scheduled to arrive at around 10 am, and the majority of adult men also worked as baggage porters in the port, they agreed to go and look for the migrant fishermen after KM Tatamailau had left. However, on the other side of the port, Andreas Kaokapaitiparo (head of Hiripau village) and Jhon Johanis Yakiwur (head of Poumako village) came to ask the head of neighbourhood association 9 Poumako to discuss the issue of the permit issued to migrant fishermen at the Poumako police post. They were accompanied by two on-duty police officers, and several indigenous fisherfolk were also present. The document, which was said to be a permit, was read out so that everybody could hear. Notwithstanding this, the indigenous fisherfolk were unsatisfied and protested. Their problem was that indigenous fisherfolk, community leaders and LEMASKO had not been invited to speak, find agreement and take the decision together. The issue triggered a quarrel which the police were able to mediate. Once they had left the police station, the neighbourhood association head suggested to the two village heads that they go home so as not to invite trouble. They both left using public transport. After KM Tatamailau left Poumako port, all the younger indigenous fisherfolk started making towards the river mouth. They used about ten longboats, with an estimated four-to-six people in each boat. They went towards the river mouth which they guessed would be the place the migrant fishermen were looking for a catch. This movement of young people made some of their parents quite worried, including a mother who felt she had to go out to sea to advise the young people about the dangers of trying to settle such issues at sea, especially since the boats they were using were not particularly suitable, given the inclement weather. After hearing this advice, the young fisherfolk called off their plan and chose to wait for the migrant fishermen at the port. Several of the longboats that had left to chase the migrant fishing boats started to come back. As they came back, they pulled up alongside the migrant fishermen’s boats. Some of the young people climbed aboard the migrants’ boats. There were around two young indigenous people on each boat. Gradually the migrant fisherfolk’s boats came back to the port, together with their indigenous escorts. Not long afterwards, the head of the migrant fishermen telephoned the head of neighbourhood association 9 Poumako to say that indigenous fisherfolk had confiscated and were holding migrants’ boats. Wanting to ensure the safety of the confiscated equipment, two of the migrant fishermens leaders, Sami Werinusi (a member of the Mimika Regency Guards (Satpol PP) and co-ordinator of the migrant fisherfolk) and Budi (a businessman from boat company Camar Papua), accompanied by some other people, went looking for the neighbourhood association head. Once they had met him, he was asked to discuss the issue at the harbour police office. At that time, the migrant fishermen had already filled the police office, and even the road leading to it. For this reason, the majority of indigenous fisherfolk chose to remain outside the police post premises, mainly around the long row of kiosks across the street. For unknown reasons, Sami Werinusi got angry and left the police post without excusing himself. He approached one of the indigenous fisherfolk, snatched the bottle he was holding and struck him on the head with it. Upon seeing this, the indigenous fisherfolk got angry and tensions rose towards Sami Werinusi and the group of migrant fishermen. Push and shove was inevitable. At that moment three shots were heard. Theodorus Camtar, who had been standing near the flagpole, was the target of one of these bullets which left him dying. Meanwhile two other young men, Rudi Safan and Gerardus Namipok were shot in the arm and hand respectively. The shots came from Chief Brigadier Yusuf Salasar (a member of the intelligence unit of Military Command Post 174/ATN). He opened fire whilst concealed behind the outside corner of the police post building. Seeing this, the indigenous fisherfolk were angry. They chased Sami Werinusi who took refuge in the police station. Inside the station, they tried to get hold of Sami Werinusi and also went looking around the police station for the person who had fired the shots. In their efforts to do this, facilities both inside and outside the police post were destroyed. At the same time, second corporal Andi (a member of the intelligence unit of Mimika District Military Command 1710) was stabbed. Once the situation was under control, the police evacuated Theo’s body and the other victims to the Mimika General Regional Hospital. Accompanied by police and family members, Theo’s body and one of the wounded arrived at the Mimika general hospital. Theo’s body was held for several hours to carry out an autopsy, and then brought home by his family to Asmat village, Poumako. Augustina (a female Papuan community leader) lead the prayers in the deceased’s home. The body was then blessed by the parish priest of St Emanuel Mapurujaya parish, Pastor Yonas Purnama OFM, and taken to the final resting place. At around 12.40 pm, Pastor Yonas Purnama led the burial ceremony in the Kaugapu public ceremony. The general situation for indigenous people in Poumako is slowly getting back to normal. Everybody has started to go about their daily activities as before, apart from the family of the deceased, Theodorus Camtar. Despite this, an atmosphere of mourning is still the dominant mood. However the indigenous people are also being haunted by a feeling of anxiety and threat. The cause is a number of attempts to install fear they have received by telephone from different sources, including members of the Water Police Unit of Mimika Police HQ, members of the intelligence unit of Mimika District Military Command and the military police unit. In these telephone conversations they are asked about the whereabouts of fishing boats or equipment which is supposedly missing. They have been ordered to find and return them, if they don’t want to face new problems and further dealings with authority. It is important to be aware that the principal issue in this bloody incident has not yet been deal with. All parties are urged to show restraint and let the police or competent institutions carry out investigations. The fact that a person was killed should not be obscured by spreading trivial stories concerning manufactured goods which can be replaced. Apart from the issue of the shooting, there is also a need to reveal which actors are involved in the fishing business around Poumako, which has already claimed victims. The outlook for the plantation industry in Papua has started to show signs of change recently, both because of a sustainability drive in the palm oil supply chain, which has forced many companies to suspend deforestation plans, and better-informed indigenous communities increasingly opposing companies’ attempts to acquire their land. Not all companies are taking these challenges lying down, however. Korindo is a Korean company which has dominated the Digoel valley in Merauke and Boven Digoel for decades through its logging concessions which supply its plywood factory in Asiki and several oil palm plantations, which have expanded rapidly since 2012. 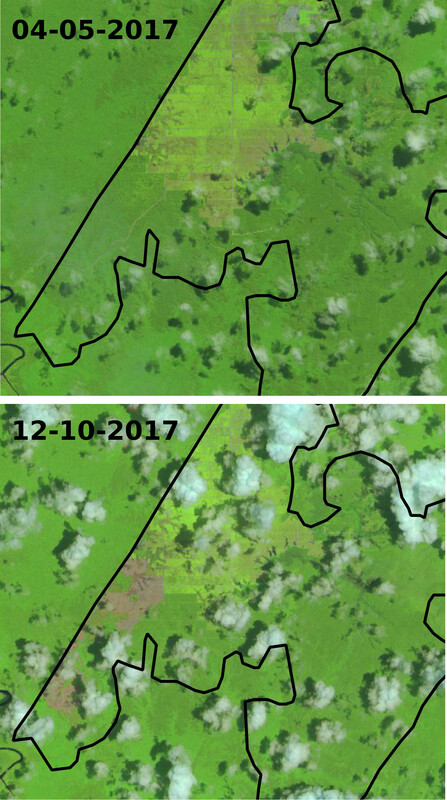 Alarmed by the rate of deforestation it was noticing on satellite images, Mighty Earth, a US-based NGO, produced a report intended to spark a campaign against Korindo. The first target was palm oil traders with sustainability commitments, who were asked to refrain from buying Korindo’s palm oil, citing issues such as deforestation, evidence of illegal burning and abuse of indigenous people’s rights in Papua and on the island of Halmahera, Maluku. Korindo responded to the pressure by publicly declaring a moratorium on new land-clearing to ensure it didn’t lose customers for its palm oil, but promptly violated this by continuing to clear primary rainforest in its PT Papua Agro Lestari concession. No longer trusting the company to keep its word, Mighty stepped up the pressure, focussing on Korindo’s other business interests, including its wind turbine business in the US. They also successfully persuaded the FSC to investigate Korindo’s certification for its plywood products, by pointing out that by clearing primary forest, the company was violating the conditions of the certification. Most recently they have focussed on pressuring Samsung to abandon a recently-announced joint venture with Korindo. It seems like the combination of challenges to its various business interests has hurt Korindo significantly. Apparently determined to continue clearing forest, the company has gone on a major propaganda drive, and its strategy has been to portray the NGO as an obstacle to community development. The company’s main argument has focussed on one of the plantations, PT Dongin Prabhawa, on the border of Merauke and Mappi Regencies. Korindo is claiming that it has to continue to deforest to meet its commitment to provide 20% of the plantation area to the local people in the form of small-holdings, known as a plasma scheme, which is an obligation for all plantation companies under Indonesian law. On 24th July, the company organised a ‘stakeholder meeting’ in Jakarta. However the only stakeholders present were those who supported the company. The company brought several indigenous members of the co-operatives it had formed to manage these plasma schemes to speak at the meeting. Other local people had signed statements opposing what they described as the ‘moratorium from the LSM’. The company also brought the Bupatis of both Merauke and Boven Digoel to the meeting, who spoke in favour of the scheme. In a sign that this meeting may have been part of a wider backlash against the moves by several major palm oil traders to eliminate deforestation from their supply chain, other speakers included Firman Soebagyo, a member of parliament who is head of the working committee preparing a new law on oil palm plantations, a law which NGOs judge as superfluous and pandering to oil palm industry interests. Nyoto Santoso also spoke, a professor from Bogor Agricultural University who has also recently had to deal with severe criticism from NGOs – they have revealed that he has a history of writing partial, incomplete, biassed or even downright false environmental and social impact assessments, including in Papua for the Noble and Goodhope groups. While it is totally reasonable for local people to demand the 20% smallholding area they have been promised, the company is not being entirely honest by portraying this as the main issue at stake here. There is no reason, other than possibly the cost, why these schemes could not be developed in areas already cleared. The reason why Korindo felt forced to declare a moratorium is because major palm oil traders have issued policies declaring they will not buy from companies which deforest. But is this really a clash between the global agenda to halt tropical deforestation and a local desire for economic development? It’s not as simple as that. Another serious problem with Korindo’s operations was highlighted in a press conference held in Merauke on 9th August, the Day of the World’s Indigenous Peoples. Villagers from Nakias, whose customary lands are part of PT Dongin Prabhawa’s concession, alleged that they had never given the company permission to use the land, and that the people who had received compensation money from the company were not the real customary landowners. Korindo did not carry out a participative process to ensure there was consensus on customary land boundaries, or that there was agreement between all members of landowning clans, and this has caused a long running conflict between the indigenous people living in the area. The upshot is that the land Korindo wants to use for its plasma programme is actually still subject to a land dispute. Opponents of the plantation feel that Korindo is creating divisions by persuading certain individuals to support its side. For example, Melkior Wayoken, the elected village head of Nakias village, alleged that a villager masquerading as the village head had stolen the village seal to sign a document supporting Korindo, and then joined the company’s trip to Jakarta to speak on its behalf. Linus Omba also spoke on behalf of the Wambon Tekamerob indigenous association, which represents Mandobo people living the Merauke-Boven Digoel border, near to another Korindo concession, PT Berkat Cipta Abadi, as well as Posco Daewoo’s PT Bio Inti Agrindo companies. He stated that there has also been a long running conflict between the Mandobo and Marind ethnic groups who dispute which group holds the customary rights to the land. Outside the press conference, someone from Salamepe village explained that how company had sought to divide the clans, by choosing individuals who they thought could support them, without waiting for all the clan members to reach a consensus. These individuals were then taken to Merauke city, a day’s journey from the plantation site, to sign the land surrender documents, away from the village where other villagers might object. These conflicts can be very serious. People in Merauke do not tend to engage in physical violence, but have a strong belief in black magic known locally as suanggi, and some aspects of customary law require the use of such curses. In PT Dongin Prabhawa’s area several local sources have claimed that dozens of people have died as a result of this, but it has not been documented independently, maybe because black magic is not regarded as credible outside indigenous societies. After people started dying, other clan elders felt they had no choice but to sign, to calm the threat of black magic. Most of the elders who signed the land release certificate are now dead, as are some opponents of the company. No independent investigation into these deaths has taken place, and the cultural and spiritual impact of plantation development in Merauke has never been seriously studied by any outside party, even though unexplained deaths have occurred around many new plantations. 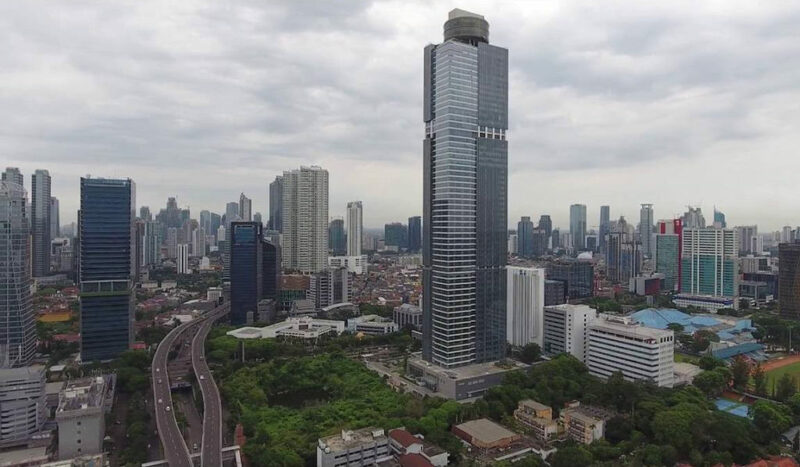 Faced with such conflicts, a responsible company would aim to resolve the conflict first, before bringing a group of supporters to lobby on its behalf in Jakarta, a move which is likely to aggravate existing community tensions. However, Korindo has shown no sign of even acknowledging that these conflicts exist. It has also not made public the indigenous land ownership maps which it based its compensation on. 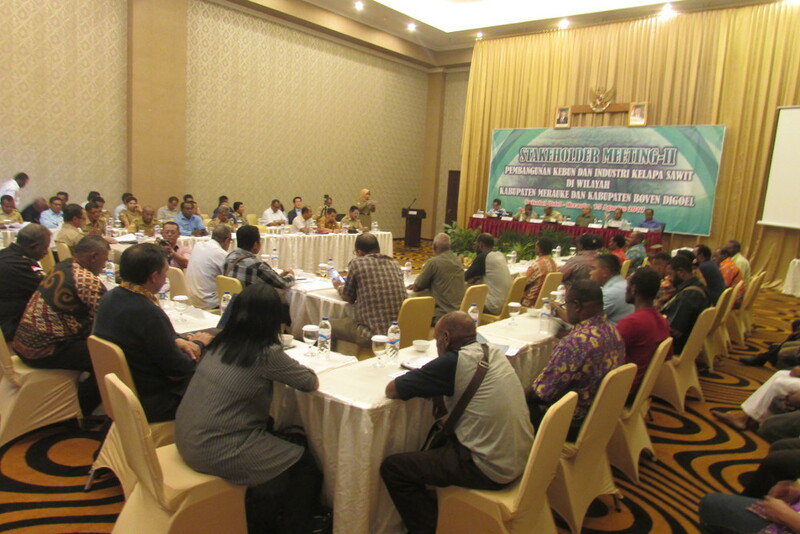 A second ‘stakeholder dialogue’ was organised in the Swissbel Hotel in Merauke on 15th August. Although is meeting also appeared to have been initiated by Korindo, the more accessible location meant that many different stakeholders were able to attend and a broader range of views were represented. Those local residents who felt cheated out of their land had a chance to speak, as did those who wanted their plasma to go ahead. Speakers from the national human rights commission, the Catholic Justice and Peace Secretariat (SKP) and the Regency-level Indigenous Association (LMA) confirmed that there were serious indigenous rights issues that needed to be addressed. No national politicians were present at this second meeting, but high-ranking officials at the provincial level spoke about their visions of development for Southern Papua, with large plantations as a major component. Most spoke fairly generally, without demonstrating much knowledge of the specific conflicts around Korindo’s plantations. A Korindo spokesperson continued the company’s attempt to portray NGOs as anti-smallholder, and did not acknowledge the complaints about the conflict, even stating as the meeting closed “Korindo feels that we don’t have a problem – maybe there is a difference with the community”. 1. 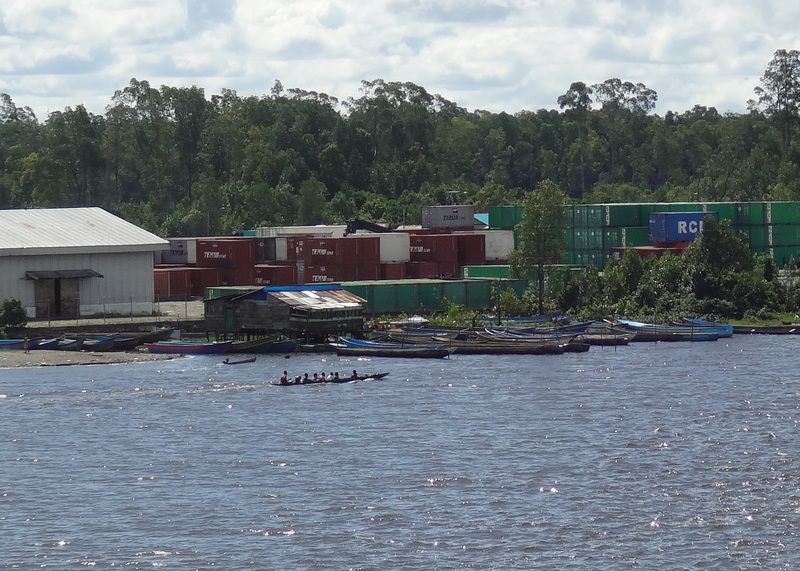 The local governments in Merauke , Boven Digoel and Mappi should take immediate action to resolve issues around administrative and customary land borders. 4. Government, NGOs and stakeholders (companies and customary rights holders) to engage in intensive dialogue. 5. Investment must respect indigenous land use structures and the environment and be in accordance with the law. The recommendation for further dialogue appeared to attract murmurs of agreement from different parties, however the process has illustrated a very fundamental reappraisal is necessary to explore if it could ever be possible that large-scale plantation development represents a positive change for indigenous peoples. This is indeed a challenge which local stakeholders need to explore, but would be a long process involving thorough investigation of the hidden impacts of large-scale development, a strong indigenous movement that can define its own agenda, and a government willing to consider a broader range of development options. It is doubtful that company-sponsored ‘stakeholder dialogues’ are the way to go about it. The Radar Sorong newspaper, on 19th April 2017, published a story about the Environment and Forestry Minister signing an agreement to change the land use designation an area of protected forest in Gunung Botak (bald mountain), Momiwaren sub-district, South Manokwari Regency, West Papua province. According to the head of the Papua Barat Province Forestry Agency, Hendrik Runaweri, the local government recommended a change of land use designation, where 2000 hectares of protected forest around Gunung Botak would be classified as production forest, and the minister agreed to 40 hectares. It was also reported that this protected forest had its status changed to accommodate the interests of PT SDIC Papua Cement Indonesia, which has a cement works in Maruni, Manokwari Regency, West Papua Province, as a source of raw materials for cement production. No information is yet available about how the local government or the minister managed to fulfill various conditions and procedures needed to change the land use classification of the forest, such as a study by an integrated team, a study of impacts and an agreement on boundaries involving local communities. Because of this, opinions have been voiced that the government has neglected to carry out these steps and has been overly accommodating to corporate interests. In 2014, the Environment and Forestry Minister (at that time still just the Forestry Minister), issued decree SK710 about changes of use and function of the forest estate, and land being excluded from the forest estate, which included classifying Gunung Botak in Momiwaren sub-district as an area of protected forest. According to the Strategic Environmental Review in the Papua Barat Provincial Spatial Plan (2013), Gunung Botak is a hilly and mountainous karst area, and also a zone with a risk of disaster. In accordance with the Ministerial Regulation 17/2012 from the Energy and Mineral Resource ministry which establishes Karst Landscapes, this area of state forest should ideally be maintained with a classification of protected forest. The local community explained the mythology of Gunung Botak as it related to their cultural identity and ancestors, such as the story of the Yaimeki cave or source. This is also their source of food and water catchment. This sort of knowledge and value is rarely considered when making decisions about development projects. The government is using the pretext that the extraction of quartz sand from Gunung Botak would reduce the price of the Conch brand cement SDIC produces which currently costs 57,000 Rupiah per sack on the local market. Quartz sand is currently being brought from Kalimantan, which increases the price. However, the strange thing is, Conch cement produced in Manokwari is being sold in Tual (Maluku) at 46,000 Rupiah per sack. The sky was blue that morning and the sun’s intense heat would burn your skin. Hundreds of people from the Moi indigenous community in Sorong Regency, West Papua arrived at the crossroads at the entrance to the administrative centre of Klaso sub-district, blocking the street while they unfurled banners stating their opposition to oil palm expansion in their ancestral domain. Moi people from three sub-districts in Sorong Regency took part in the road blockade on the morning of Wednesday 22nd March – Klaso, Saengkeduk and a new prospective sub-district Selekobo. It was timed to coincide with a meeting between the Sorong Regency government and oil palm operator PT Mega Mustika Plantation with the local community, which would take place in the administrative centre of Klaso sub-district. According to Agus Kalalu, who is from the Moi ethnic group, this action to close the road was an expression of the people’s frustration, because none of their previous actions had been met with a meaningful response from the company or government. “This is the fifth time that people from the three sub-districts have taken action”, Agus said. The first action started in Saengkeduk village, and was followed by a second action in Klaben village in 2012. The third action was in front of the Sorong District Legislative Council building in 2016 and then most recently during a meeting with the Sorong Regency Forestry Agency in 2016. 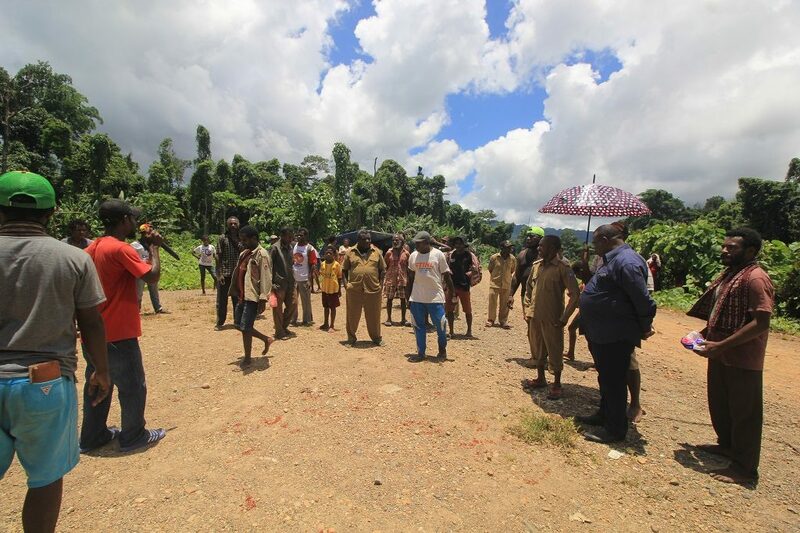 David Ulimpa, a Moi indigenous community leader as well as being one of the customary landowners in Klaso sub-district, stated the reasons for opposition to the oil palm plantation in a speech, believing that it would have no effect on the community’s economic wellbeing. On the contrary it would bring hardship.